From now until 31 December 2015, book your meeting and enjoy “Buy-One-Get-One-Free” deals on hotel rooms and meeting packages as well as complimentary round-trip Cotai Water Jet tickets or food and beverage credits. This offer is available for meeting and staying at the following Sands Resorts hotels: The Venetian Macao, Conrad Macao, Cotai Central, Holiday Inn Macao Cotai Central and Sheraton Macao Hotel, Cotai Central. 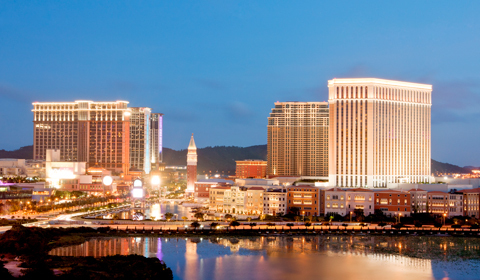 Contact our MICE specialist today and learn why Sands Resorts is the most ideal meeting destination in Macao! Complimentary Stay: Book one room night and enjoy complimentary extra night. Complimentary Meeting: Book one meeting package and enjoy a complimentary package for the second night. Complimentary Transportation: Enjoy complimentary round-trip ferry tickets between Hong Kong and Macao with pick-up service. A minimum stay of 2 consecutive nights is required with 50 rooms per night are required. Offer is valid for all new enquiries when contracted by 31 December 2015 for arrivals up to and including 31 August 2016. Offer is subject to limited availability of guest rooms and meeting facilities at the time of contracting. Payment must be made in accordance with the time frames specified in the contract to receive offer. Offer is applicable at The Venetian Macao; Conrad Macao, Cotai Central; Sheraton Macao Hotel Cotai Central and Holiday Inn Macao Cotai Central. Green Meetings Program Audio and Visual Equipment offer can be applied. Package must be referenced on initial enquiry to validate offer and it may not be combined with any other offer, promotion and/or discount. All complimentary offers are subject to tax and service charge. The maximum number of delegates applicable to this offer is 1500. A minimum of 50 rooms per night up to a maximum of 750 rooms per night must be booked to qualify this offer. Complimentary stay is only applied to the least expensive room night. The booking must be of the same number of rooms per night, or the discount is applied to the booking of lower number of rooms. Complimentary meeting package for the second day is of equal or less value as the meeting package purchased for the first day. The booking must be of the same number of delegates per day, or the discount is applied to the booking of lower number of delegates. Spend of HK$500+ per delegate on F&B to get a maximum of HK$500 F&B credits for the next day, which must be consumed in the same period scheduled for group event. This offer only applies to banqueting meeting or event. This offer is only available for round-trip Cotai Water Jet sailings (Cotai class only) and Sands China Limited-owned coach transportation. 14-day advance booking is required for ferry and coach arrangement. Maximum booking of each Cotai Water Jet sailing is 150 persons on regular schedule.